From the blue lights and glow-sticks at The Great Northern Bar in Whitefish, Montana, graduate student Nicky Ouellet followed a band backstage to understand the mission behind their music. Ouellet’s subsequent radio story, “An ‘80s Cover Band With Global Dreams,” recently won Best in Festival in the student news competition for the Broadcast Education Association’s Festival of Media Arts. While the band came together for their mutual love for ‘80s music, they also wanted to find a way to be able to live off their “Rocky Horror Picture Show” style performances. Members of the New Wave Time Trippers told Ouellet that they hoped to turn these occasional night gigs into a full-time job by playing at corporate events and landing a regular show in Las Vegas. “I thought it was a really interesting combination of the artsy, but also the business savvy,” Ouellet said. For her, capturing a sense of place was equally as important as recording the essence of the Time Tripper’s music. Ouellet plugged a Marantz kit directly into the bar’s sound system to record clean copies of the songs and set up a secondary recorder to capture the crowd’s experience. After taping two of their shows, one in Whitefish and one in Missoula, Ouellet spent hours listening to the footage, recording her own narration and trying to keep the story under five minutes. The intimacy of radio originally drew Ouellet to the medium. She said the power of each story to delve inside someone else’s head made her change the way she saw the world. “You kind of lose sense of the thing directly in front of you, and it’s like this whole world of your mind and that of the story-teller are blended,” Ouellet explained. Since the Time Tripper piece, she and Banville have been working closely together on Ouellet’s professional portfolio, which she will defend in May to receive her master’s degree in journalism. Her portfolio includes both written and audio pieces, examining how Native Americans manage natural resources on tribal lands. 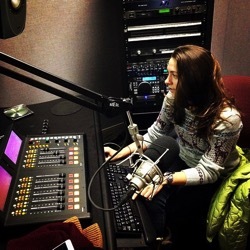 Ouellet is currently applying to jobs and fellowships for after graduation, and she hopes to find a position that lets her continue to use both print and radio. To hear more about Nicky Ouellet’s Best in Festival piece and the production process, watch her video interview on the School of Journalism’s Vimeo account, or click here to read the transcript of her interview. See more of Nicky Ouellet’s work in print and radio on her blog’s portfolio. Stay up to date with more UM J-School radio pieces by listening to Jule Banville’s podcast series Last Best Stories.